One of the toughest, but also one of the most beautiful winter blooming perennials! We have a special hybrid Hellebore new to UW Botanic Gardens! Striking color and accent for year round containers. The golden Monterey Cypress is popular and readily available for gardeners! A favorite little shrub for winter containers adding interest, color and intrigue. A sweet and lovely surprise for fall as Camellias start putting on a show. See Camellia sasanqua ‘Setsugekka’ in full bloom this month! These ornamental St. John’s Worts are a departure from the aggressive species often used in slopes and roadside median strips. These new introductions have adorable flowers and fantastic berries! A most unusual, but easy to grow annual known as the African Daisy. Learn about a stunning ornamental grass from New Zealand that’s catching the eyes of visitors in Pacific Connections. 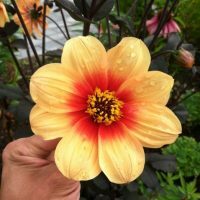 Adding high impact color to your summer planting scheme, dahlias are dazzling and definitely worth seeking out especially these more unusual selections that combine well with other plants. Striking elegance with remarkable hardiness and vigor, ‘Tiger Babies’ lily is considered a classic amongst lily growers worldwide. The Northwest’s own Pacific Coast Irises are coming into bloom!